Whilst planning your expedition to Antarctica, we know which penguins and where to see them will be a consideration. So, if there’s a certain penguin you’re dying to see, we can help. We’ve compiled a list of all the penguins you can find in the Antarctic and Subantarctic islands. And suggested where you can expect to find them and the best time of year to see them. There are 17 species of penguins, all 17 live in the Southern Hemisphere with the highest concentrations found in the Antarctic and subantarctic islands. 8 of these live in Antarctica and/or the subantarctic islands. Adélie and emperor penguins breed on the shores of the Antarctic continent and nearby islands. Chinstrap penguins breed on islands around Antarctica and Gentoo penguins are found on islands throughout the Antarctic and the subantarctic. The King, Royal, Southern Rockhopper and Macaroni Penguins live on the subantarctic islands; however one colony of Macaroni penguins is known to live on the Antarctic Peninsula. Adélie penguins are medium sized penguins, weighing between 3 and 6 kg and standing roughly 70 cm tall. The white ring surrounding their eye distinguishes them from other penguins. It’s fairly difficult to tell males and females apart, as they are similar in size and appearance. During breeding season in October, Adélie penguins venture out to the rocky Antarctic coastline where they live in colonies upwards of a thousand penguins. The most common of all the penguins in the Antarctic region, you can find large populations of Adélie penguins in the South Shetland Islands; on Penguin Island south of King George Island, the Weddell Sea region; home to large Adélie penguin rookeries, and the Antarctic coastline; particularly in Petermann Island. Adélie penguins are found in many other areas across the Antarctic region but we think these regions offer the best sightings. Their name is derived from the narrow line of black feathers that extend from ear to ear. Males and females look similar, however males are usually larger and heavier. Chinstrap penguins breed mainly on the Antarctic Peninsula as well as islands in the South Atlantic Ocean. There is a small breeding population on the Balleny Islands, south of New Zealand. Towards the South of the South Shetland Islands, on Half Moon Island, you will find a sizeable chinstrap penguin rookery. Large populations of Chinstrap penguins are also found in the South Shetland Islands on Penguin Island, south of King George Island. Another great island for Chinstrap penguin sightings is Elephant Island, which is home to an impressive Chinstrap penguin colony. The Emperor penguin is the largest of the penguin species; their average height is 115cm and at the start of breeding season, adults can weigh up to 40kg. Emperor penguins have yellow-orange feathers around their neck and head, however the colour is not as bright as that of King Penguins. While the two look similar, emperor penguins are larger and the two penguins are rarely if ever found in the same area. They breed in colonies ranging in size from a few hundred to over 20,000 pairs scattered around the Antarctic continent. Most colonies stay on the fast-ice (frozen sea), locked between islands or grounded icebergs. While the emperor penguin is the largest living penguin, you’d be surprised how challenging it can be to spot one in Antarctica. They breed throughout the Antarctic winter and as mentioned earlier, most of the colonies we know of are situated on fast ice (frozen sea attached to the Antarctic continent). In addition massive icebergs often surround emperor penguin colonies, meaning one could be within a few hundred metres away but you may not see them. Finding a colony of emperor penguins is a challenge also because during the winter and while they incubate their eggs they move around a fair bit. During winter storms the emperor penguins will huddle, however, when the worst weather is over the colony spreads out, shifts location, and the huddles reform during the next blizzard. The best chance of seeing large numbers of emperor penguins is in Snow Hill in the Weddell Sea region. They live in other areas, however those areas are usually restricted to researchers. The third largest penguin species, Gentoo penguins usually weigh between 5 and 8kg. Males are usually larger than females, however it can be difficult to spot the difference. 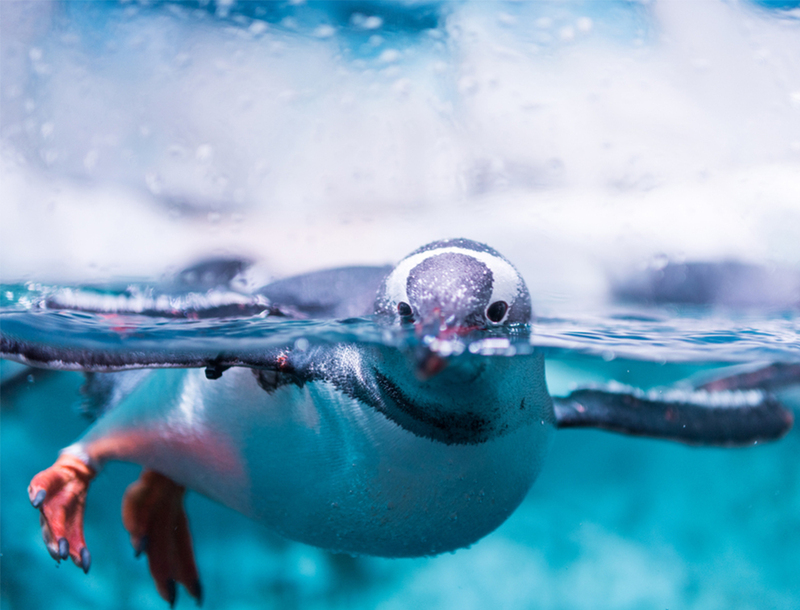 In terms of physical appearance a bright red-orange bill and prominent white patches around their eyes make both adult and juvenile Gentoo penguins easily distinguishable from other species of penguin. Gentoo penguins breed on many sub-Antarctic islands as well as the Antarctic Peninsula. The largest populations of Gentoo penguins are found at the Falkland/Malvinas Islands, South Georgia, and the Antarctic Peninsula. King penguins are the second largest living penguin species, second only to the emperor penguin. Their appearance is similar to emperor penguins, however they are significantly smaller, weighing 10-15kg before breeding season and 8-11 after breeding season. Their brightly coloured orange ear patches that extend via a thin strip to the upper chest distinguishes them from other penguins. King Penguins breed on many of the Sub-Antarctic Islands. South Georgia and Crozet islands are home to the largest populations. Here there are several hundred thousand breeding pairs. The colonies occupy beaches, and valleys and moraines free of snow and ice. King Penguins prefer level ground near the sea. King penguins are occasionally found on South Sandwich Island off the Antarctic Peninsula. Some new colonies have been seen establishing themselves in Patagonia, South America. Macaroni penguins weigh between 4 and 7 kg depending on their breeding stage and gender, and are approximately 70 cm tall. Life expectancy is 20 years or more. The Macaroni Penguin is easily distinguishable from other penguins due to the yellow-orange crest on their heads. This crest starts between their eyes and extends through their head in a V-shaped form. Macaroni Penguins have bright red eyes with a thick, orange beak. The Sub-Antarctic islands is where you can find the Macaroni Penguin. The Antarctic Peninsula is home to one colony. South Georgia, Kerguelen, Heard, McDonald, Crozet and the Marion Islands feature larger colonies. Despite their mid size, Royal penguins boast larger crests. They look quite similar to Macaroni penguins. However, Royals are up to 20% larger and tend to have white to pale grey faces while Macaroni penguins have black faces. The yellow plumes on their heads meet on the forehead. It takes several years for the crests to develop fully. That is why, in young penguins the crests are not as lush as in adults. Males and females are similar but males tend to be somewhat larger. Royal Penguins are prevalent in Macquarie Island. This is where the vast majority lives, as well as the nearby Bishop and Clerk Islets where approximately 1,000 pairs breed. Royals at Macquarie Island live in very large colonies. The largest colony at Hurd Point on Macquarie Island has around 500,000 pairs. The Southern Rockhopper penguins are the third smallest penguins weighing only 2–3.8 kg. This makes them only a little bigger than the Galapagos penguins and little penguins found in Australia. Their crest feathers sit over their eyes like eyebrows and then branch off the sides of their heads. Different to the Macaroni penguin crest which starts at a point above their beaks and flairs out past the eyes. The Southern Rockhopper penguins call the Sub-Antarctic islands home; in particular, Heard Island and the McDonald Islands, as well as Macquarie Island and the Falkland Islands.